A popular real ale festival is returning to the Magna Science Adventure Centre in Rotherham this year. The three-day event attracts thousands of beer, food and music fans and raises thousands for local charities. Following a switch to a summer date and unable to get a suitable date last year, the Magna Real Ale and Music Festival is back at the former steelworks on March 2 - 4. Timothy Taylor, the renowned Yorkshire Brewery, is to launch its new beer Knowle Spring Blonde at the Rotherham Real Ale and Music Festival at the Magna Science Adventure Centre in March. The 4.2% easy-drinking yet complex blonde beer is the brewery's first addition to their core range since 1952 and festival organisers are delighted and honoured that South Yorkshire drinkers will get this exclusive and historic opportunity to try the beer at their event. Named after the Knowle Spring on which the brewery sits, and from where they draw spring water for all their brews, it is a full-bodied beer with floral and grapefruit aromas, spiced orange on the tongue followed by citrus hop flavours to finish. 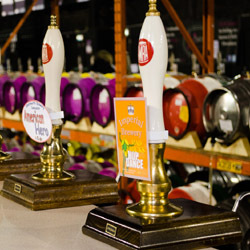 Around 150 real ales are set to be on offer, as well as a selection of ciders, wines and foreign bottled beers. Further details of the event, which has been given the 2017 theme of "Mine's a Pint" to celebrate the proud history of the coal mining industry in South Yorkshire. Already confirmed for the festival are The Buffalo Skinners and Acoustic Angels who will appear on the atmospheric main hall stage. This year the festival has chosen to donate all proceeds to the Rotherham Cancer Care Centre which provides valuable and unique support outside of the medical environment for people diagnosed with cancer. Their volunteers rely entirely on donations to provide a wide range of therapies and counselling.